The 35th Infantry Regiment Association salutes our fallen brother, PV2 Walter Clair Hackenberg, US52039785, who died in the service of his country on April 25th, 1951 in South Korea. The cause of death was listed as Captured-Died POW. At the time of his death Walter was 23 years of age. He was from Middleburg, Pennsylvania. Walter's Military Occupation Specialty was 4745-Light Weapons Infantryman. The decorations earned by PV2 Walter Clair Hackenberg include: the Combat Infantryman Badge, the Purple Heart, the National Defense Service Medal, the Korean Service Medal, the United Nations Korea Service Medal, and the Republic of Korea War Service Medal. Private First Class Hackenberg was a member of Company F, 2nd Battalion, 35th Infantry Regiment, 25th Infantry Division. He was taken Prisoner of War while fighting the enemy in South Korea on April 25, 1951 and died while a prisoner on September 9, 1951. His remains were not recovered. His name is inscribed on the Courts of the Missing at the Honolulu Memorial. Private First Class Hackenberg was awarded the Combat Infantryman's Badge, the Prisoner of War Medal, the Korean Service Medal, the United Nations Service Medal, the National Defense Service Medal, the Korean Presidential Unit Citation and the Republic of Korea War Service Medal. After he was taken prisoner in Korea in 1951 and declared deceased, a tombstone for Army Pfc. Walter Hackenberg has sat above an empty grave in his family's cemetery plot outside Middleburg in Snyder County. "We assumed all this time he was no longer living, but just to think of where he could be - it was a missing part of our family," said his sister, Stella Knepp of Middleburg. For years the Army had labelled the unidentified remains that turned out to be Hackenberg's as "X-14266," and were buried in 1954 in the National Memorial Cemetery of the Pacific in Honolulu as Korean War Unknown. Now, through DNA analysis, Hackenberg's remains are returning home to Middleburg for burial, the Defense POW/MIA Accounting Agency has announced. "We're very fortunate to have his remains back," Knepp said. "He was a good brother - I'm proud to be his sister. I just didn't know him a long time." Walter, who would have been 89 this year, was talked about at family birthday gatherings, at holidays. In 2000, Knepp said the minister at her church told her he'd check into the status of her missing brother, and found some had been buried in Hawaii. Soon after, Knepp and one of her sisters were asked to submit DNA. "Then we went another 17 years - two of our sisters passed away in that time. So we're happy to bring him home, very happy. We'd rather have brought him home alive, but I guess God had different plans. We'll still just be thankful what has happened," Knepp said. Hackenberg, 22, was a member of Company F, 2 nd Battalion, 35 th Infantry Regiment, 25 th infantry Division, along a defensive line west of Chorw'on, South Korea, when his unit was attacked by the Chinese People's Volunteer Force and Korean People's Army, said the Army. American troops were able to hold the lines, and when the attacks subsided, a patrol went to determine possible enemy river-crossing points. Enemy forces engaged the patrol with mortars and small arms fire, forcing the patrol to withdraw. Hackenberg could not be accounted for at the end of the battle, and he was declared missing in action April 25, 1951. 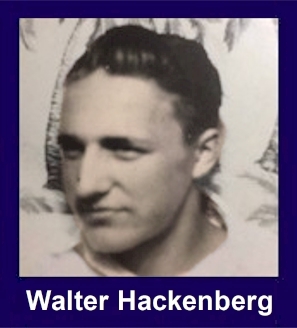 After the war, several returning American prisoners of war reported that Hackenberg had been captured by the CPVF and died in the summer of 1951 while being held in a prisoner of war camp. Based on this information, the U.S. Army declared him deceased as of Sept. 9, 1951. In 1954, United Nations and communist forces exchanged the remains of war dead in what came to be called "Operation Glory." All remains recovered were turned over to the Army's Central Identification Unit for analysis. On Sept. 7, 1954, a set of remains reportedly recovered from a prisoner of war cemetery at Camp 1 and 3, Changsong, North Korea, were sent to the Central Identification Unit in Kokura, Japan, for attempted identification. The set of remains was designated "X-14266" and was transferred to the National Memorial Cemetery of the Pacific in Honolulu and interred as a Korean War Unknown. After historical and scientific analysis, it was determined that X-14266 could likely be identified. After receiving approval, these remains were disinterred June 13, 2016, and sent to the DPAA laboratory for analysis. Scientists used dental, anthropological and chest radiograph comparison analysis, which matched his records, as well as circumstantial evidence. Stella Knepp has good memories of her brother Walter, who went to war in 1951 when she was 12. "What can one guy do with eight sisters? We did a lot of fun things together. It's too bad he couldn't be around longer." Hackenberg was drafted, said Stella Knepp. He wasn't in Korea long, but it was very hard on their mother, Knepp said. It wasn't long after he disappeared that their mother became ill and died. His return, Knepp said, "is absolutely a blessing." There are still 7,718 Americans' remains unaccounted for from the Korean War, and Knepp said it's important for other families to know that the military continues working on identifying remains. "After all this time I think it's important for others who have had the same thing happen," she said. He will be buried Nov. 2 beside their mother in the cemetery at Zion United Methodist Church outside Middleburg. There will be visitation at the church starting at 1 p.m. Nov. 2, with a service at 1:30 p.m. and burial afterward. Walter is survived by five of his eight sisters: Stella Knepp, Helen Herman, Peggy Walter, Darlene Sycz and Linda Walter, all of whom live in central Pennsylvania. His father preceded him in death in 1975, as did three half-brothers and one half-sister.